The objective of the application is to heat a magnetic steel cutting tool for a brazing application. The end product is a cutter for the logging industry. An Ambrell EKOHEAT 45 kW/100 kHz induction heating system is used for this application. With an EKOHEAT 45 kW induction power supply, the part can be heated to temperature within 150 seconds. Despite testing occurring on a 45 kW /100 kHz power supply, Ambrell actually recommends an EKOHEAT 50 kW/30 kHz power supply. This unit can deliver power at lower voltages due to increased capacitance. This results in the unit running at a lower frequency. Since it runs at lower voltages, the Ambrell Auto Tap feature can be leveraged. Auto Tap is a feature in Ambrell EKOHEAT power supplies which allows the transformer tap to automatically change during a heat cycle. 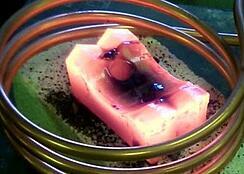 This is particularly beneficial when magnetic properties experience changes during heating, which is the case here. It improves the power delivered during the heat cycle and can reduce the heat cycle by at least 20 seconds. Brazing is one of our specialties. Our Brazing Guide offers more background on brazing efficiently. We also offer a rich library of induction brazing application notes - find out by clicking the button below!